Contrast angiography was performed to investigate the blood flow through the iliac arteries during the on-going pre-clinical trial with the unravelling stent compared to a traditional bare metal stent. A traditional stent had been implanted on one side and the unravelling stent on the other but removed two weeks before angiography. The pictures illustrate the two implantation sites. The left picture is taken from the vessel where the unraveling stent previously had been located. The right picture is from the side where the traditional stent remains. 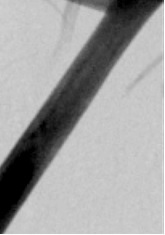 The “grid” appearing on the right picture is the traditional stent. The contrast does not reach the inner surface of the stent on any side.The distance between the contrast and the surface of the stent is due to restenosis/scar tissue formation on the inside of the stent. At the red arrow, the stenosis (“in-stent restenosis”) is significant (more than 50% reduction compared to the original lumen). This is to be compared with the picture to the left where the stent was removed through unravelling, resulting in an unaffected blood vessel and normal blood flow. – This indicates that the blood vessel is not harmed by the unravelling process of our stent. It does not seem to trigger restenosis, but this is the case with the remaining traditional stent in our big animal model, as in humans, says principal investigator Erney Mattsson. The hypothesis of the innovative stent design seems to be supported. We are now curious to see the in-depth results from the up-coming histology analysis. The study is performed in sheep. The time aspect may vary in comparison to humans. 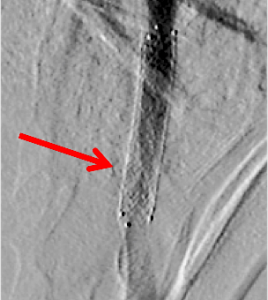 The traditional stent had been located in the iliac artery for 2.5 months when the angiography was performed.